And so I preseent my entry for this round of the Mid-Week Flash Challenge. The old man was finally dead. Murder wasn't one of Bertram's usual activities, but he had grown tired of waiting, of being disparaged, of wondering how long he would remain in his father's good favor—and his will. Bertram was his only child; it was fitting that the old man's landholdings should go to him alone. There had been too many threats to divide the property among cousins, friends—even charities. Action needed to be taken. To set up his ruse, Bertram had mentioned in casual conversations how his father had taken a trip overseas for business. A steamship ticket had been purchased in his father's name and given to a man whose silence was easily bought. The chance meeting with a person needing to avoid the authorities had proven fortuitous. When his father never returned, inquiries would be made, of course, but nothing would be found. People would assume he'd fallen overboard or disappeared in the dark streets of some exotic port. Eventually he'd be declared dead. Until that time, Bertram would run the plantation as if he expected him to return at any moment. Once his father was officially deceased, the property would be his. Then there was the problem of the body to deal with. It had to be disposed of in a manner that would leave no trace. Bertram placed the corpse on a bed of straw in the barn. This would absorb any blood. The straw could be burned later on. He dismembered the body, cutting it into parts of appropriate size for an old potter's oven. He made the fire hot enough to destroy the soft tissue leaving only ash. Any bones remaining would be ground into unrecognizable dust. Even the clothing and luggage he might have taken along on the voyage were reduced to a gray powder. The old man's head was last. Bertram had set it in front of the oven as if to force him to watch his own destruction. He held it up by the hair, recalling the way he'd looked into his eyes and snarled, "It'll all be mine now!" He thought it odd how the old man cursed him, then laughed, just before he plunged the blade into his chest. With his dying breath, he'd said, "So be it." Bertram grinned and tossed the head into the oven. He smiled a little wider with each satisfying pop and crackle. Once it was all finished, Bertram placed the cooled ashes into a cloth sack. All he needed now was the proper time to dispose of the vile remains. He did not have to wait long. Within a few days, a summer storm passed through during the night. He surmised anyone nearby would either be asleep or sheltering from the rain and unlikely to witness his movements. As it approached, he climbed a hill in the middle of the orchard—the highest point on his father's lands. When the winds rose, he opened the bag. As he turned it to dump the ashes, a strong gust swirled around him taking them far in all directions. "Perfect," he muttered as he shook out the bag. Bertram's exuberance was short-lived, however. An early frost destroyed most of the fruit in the orchard. Horses and cows refused to foal. Hay spoiled. When the spring came, few trees in the orchard sprouted new growth. 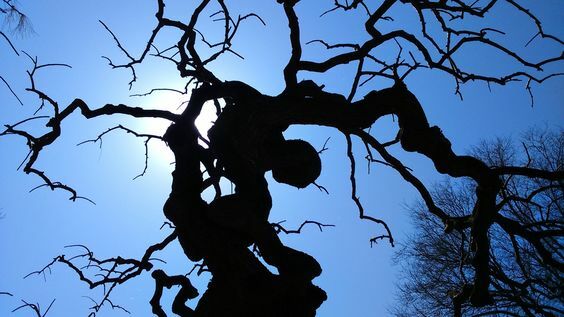 Of those that did, the branches grew gnarled and twisted, mimicking the dying forests that surrounded them. None bore fruit. Bertram sat on the hill where he had spread his father's ashes. Even the sunlight passing between the bare branches seemed weak. The trees in the orchard were mostly dead, the grass between them sparse. Even the weeds failed to thrive. He recalled his father's words as he sat alone contemplating his options. He smiled a little when he finally understood. He whispered the words, "Whatsoever a man soweth, that shall he also reap." He closed his eyes for a moment, then said, "So be it," before plunging the knife into his own chest. Nice twist at the end. Good story. Thanking for joining in. Thanks! I'm surprised that prompt picture didn't bring in a few more stories. Oh my goodness, what a story. Firstly, Bertram is a most excellent name; nextly, you have a way of sprinkling humour amid the grisly bits so that I don't know whether to cringe or to laugh out loud. This was very well done, K.
Thanks! I hadn't done anything quite this dark in a while. My stories always have a bit of humor somewhere - I'm not sure why - it must be those little voices whispering in my ear again. Is Four Pennies A Day Too Much To Ask?